Event Description: An under-utilized site for a corporate team building event, the Golden Triangle is a place people will want to get to know better. Built on the land between the confluence of the Allegheny, Ohio and Monongahela rivers, Pittsburgh is a city of bridges – 446 in total – more, in fact, than Venice, Italy. 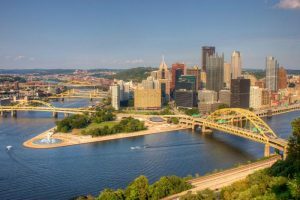 Location History: Once the site of the French-built Fort Duquesne and later the British-built Fort Pitt, Pittsburgh has evolved from the city of steel to today’s nationally-known center of medicine, education, technology and financial services. In 2005 in The Economist, Pittsburgh shared with Cleveland the top spot for liveable cities in the United States. During your corporate team building treasure hunt…expect to see a 100-year-old stained glass window; the home of the city’s first female journalist; a colonial-era cemetery; and at least one of Pittsburgh’s many bridges.